Today we’re featuring a fantastic new project that needs your support! My good buddy Rob Kelly, from The Aquaman Shrine, has started a new daily webcomic called ACE KILROY! The strip is a wonderful amalgamation of Indiana Jones-style pulp and the old Universal Monsters. Each day Rob and his artistic partner Dan O’Connor serve up another installment of Ace’s adventures. This week, Ace has been given the mission of tracking down the real-life Dracula, before the Nazis can get their dastardly mitts on him. If that wasn’t cool enough, the briefing of the mission is being given by President Franklin Delano Roosevelt himself! FDR talking about Nazis and Dracula… heck yeah! Just like a newspaper comic, this webcomic features a new black & white strip each day and a triple-sized color strip on Sunday! Click here to read ACE KILROY! Once there, click “Archive” above the strip to read the series from the beginning. ACE KILROY is a real labor of love for Rob and Dan. There is an expense in time and money associated with producing these strips. Therefore, they’ve put ACE KILROY on Kickstarter in hopes of raising funds for the following purposes: 1) keep the strip from losing money for the next couple months; 2) raise enough money to start collecting the strips in trade paperback form; and 3) get the word out through online and print ads. I truly believe in this project and their reasons for doing some minor fundraising. I’ve made a pledge myself and urge you to do the same. You can pledge as much as you want, or as little as $5. Kickstarter uses Amazon for pledge transactions, so it’s super-easy and reliable. Check out the video below for more details on the ACE KILROY Kickstarter effort. Click here to pledge a donation to ACE KILROY! Wasn’t that an awesome video?!?!?! 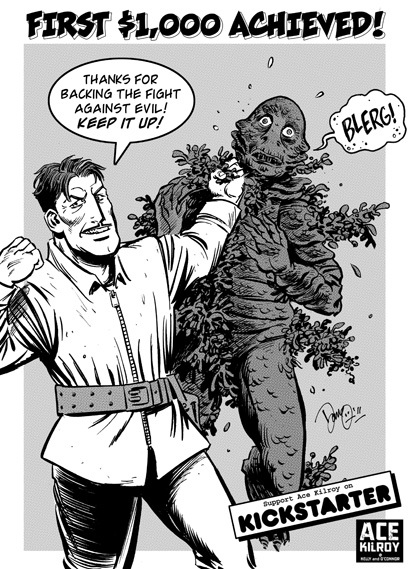 So, are you interested in reading a daily dose of an Indiana Jones-like hero duke it out with Nazis, Dracula, and the Creature from the Black Lagoon? If so, then support ACE KILROY on Kickstarter! Or if you’re just a good soul who wants to support two massively-talented creators fulfill their dream, then support ACE KILROY on Kickstarter! It’s only on Kickstarter for a limited time, so don’t delay! If donating isn’t an option for you right now, please consider promoting ACE KILROY to others through whatever social media channels possible. Support ACE KILROY!